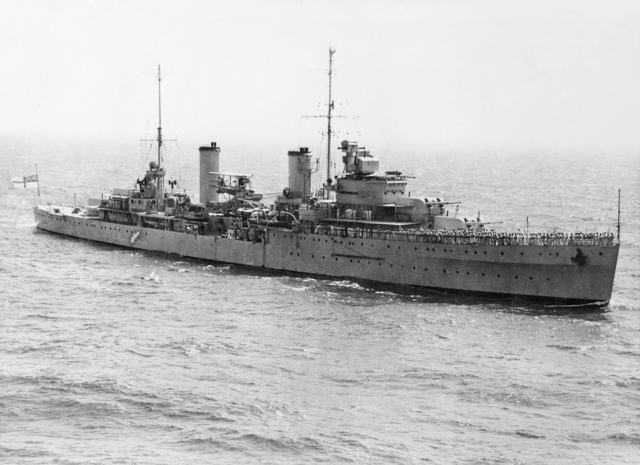 On 19 November, 1941 the Australian light cruiser Sydney disappeared. Because of wartime radio silence procedures, she wasn’t missed for several days. Searches began on 24 November and continued though the 29th. HMAS Sydney was a substantial warship. Commissioned only six years before, she had recently returned to Australia from the Mediterranean where she had been very active. She had shelled the Italian coast, participated in a major fleet action, and taken part in the sinking of an Italian destroyer, a light cruiser, and at least three merchant ships. At 562 feet long, 8,940 tons, armored, and armed with eight 6″ guns in four turrets, she was approximately the size of modern Burke class DDG and about twice the size of a National Security Cutter. The searchers found no survivors from the Sydney, but surprisingly found German Navy personnel. Gradually the story came out. The German sailors were from the Kormoran. Kormoran had been built as a merchant ship. She was large for the period at 8,736 tons and 515 feet long, but would be dwarfed by most modern merchant ships. She had been converted to a clandestine commerce raider. She was armed with six 5.9″ (150mm) guns dating from the first world war (only four of which could bear on a side), five 20mm machineguns, and two 37 mm anti-tank guns. In addition she was armed with six torpedo tubes, four in pairs on either side and two underwater tubes. She carried scout planes and a large number of mines. She could also alter her appearance to resemble several different allied or neutral merchant ships. 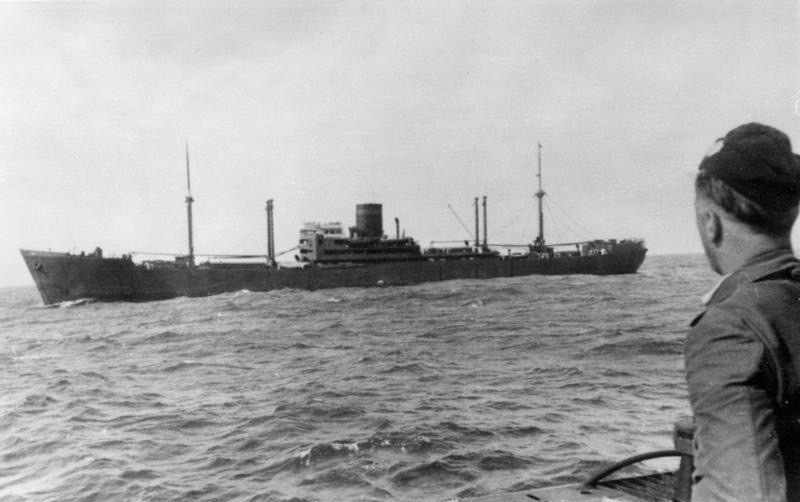 Kormoran had been away from Germany for more than eleven months and had sunk ten merchant ships and captured an eleventh. Kormoran was disguised as a Dutch freighter when Sydney stumbled upon her. Sydney made the mistake of approaching Kormoran too closely. After sighting a vessel that was not expected to be in the area, and exchanges of signals, Sydney continued to close until they were within 1500 yard, off the Kormoran’s starboard beam. When it became clear that she would not be able to fool the Australian cruiser, Kormoran broke her battle ensign and both ships opened fire almost simultaneously. Sydney’s eight round salvo was high. Kormoran launched two torpedoes. Her first salvo did inconsequential damage, but her second destroyed Sydney’s firecontrol tower, while her 20 and 37 mm guns kept the crews away from Sydney’s open secondary mounts. Sydney’s two forward 6″ turrets were destroyed before they were able to fire their second salvo. Kormoran then turned her attention to the engineroom for three salvos. Sydney’s two aft turrets began firing independently in local control. As the Kormoran fired her eighth and ninth salvo, one of the two torpedoes she had fired hit the Sydney forward, causing the bow to break downward. This forced her to veer left and pass behind the Kormoran. These events had taken only minutes. Since the torpedo would have covered the 1500 yards between them in little over a minute and 6″ guns fire at up to ten rounds per minute, it may have taken less than two minutes to severely maul an experienced first line warship. The ships now separated. Sydney limped away south, while Kormoran held her course and speed. Sydney’s forward turrets were shattered, and her after turrets jammed. She had fires in the engineering spaces and around the seaplane catapult. About fifteen minutes after the engagement had begun, she belatedly launched torpedoes at the stern of the Kormoran. Kormoran turned to port to unmask her batteries with the intention of destroying Sydney. The unguided torpedoes missed at the now extended range, the shot made totally impossible by Kormoran’s turn. At this point Kormoran’s engines failed and she went dead in the water. Still she continued firing the four 5.9″ guns that would bear at near their maximum rate, reportedly expending up to 450 of the 100 pound shells while Sydney moved slowly away. The last rounds were expended as the range opened to 6,000 meters (6,600 yards). This would have taken at least eleven minutes, and at that still relatively short range, against a slow moving target, at least one in ten shells should have hit. Both ships lost their attempts to control damage and both sank during the night. Of Kormoran’s crew of 399, 317 survived. Many of those that were lost, died when a rubber raft suddenly sank. Why there were no survivors from Sydney’s crew of 645, is a question that has prompted controversy and accusations of war crimes. When the wrecks were discovered in 2008, Sydney’s bow had broken off, but it appeared the main body of the ship had sunk upright. Investigation of the wreck also appeared to confirm German accounts of the engagement. Sydney was lost, but she did succeed in destroying the raider because, although several vital systems were destroyed early on, she had sufficient redundancy to continue to inflict damage that proved fatal. The delay in launching torpedoes was difficult to understand. She should have been able to fire the four port tubes when the action commenced. The four starboard tubes should have been able to bear as the Sydney passed astern of Kormoran. They may not have been fully readied and Kormoran’s suppressive fire on the secondary mounts may have also killed the crews of the near-by torpedo tubes or otherwise disabled them. Coast Guard ships may find themselves placed in a situation not unlike the Sydney’s while providing “ports, waterways, and coastal security” or enforcing a blockade. The CO will have to decide where to place the ship. After years of fisheries and law enforcement boardings, it is natural for Coast Guard ships to make a close approach. It has real advantages, allowing better view of the vessel of interest and their activities and shortening the time in transit for boarding parties, but in a situation where the ship might prove hostile, it may be hazardous. A more extensive treatment of the battle on which this post is based is here. The section “Why Burnett approached so close” is particularly relevant. Sydney had approached closely enough that Kormoran was able to selectively target vital systems. Kormoran would have known the location of all of Sydney’s weapons, while the Kormoran’s were far less obvious. Exploiting surprise, Kormoran used her inferior weapons to quickly shift the odds in her favor. In a similar situation, close in, it might be possible to place a cutter at a severe firepower disadvantage with only a couple of shots destroying the more potent weapons. Extending the range quickly makes this unlikely. A hostile vessel’s extemporized armament might include machine guns and anti-tank guided missiles, but there are also thousands of surplus anti-tank and anti-aircraft guns in circulation, manufactured during the cold war, ranging in size up to 130 mm (5.1″) that could be mounted on a ship and would prove effective in an anti-surface mode at short range. What all these systems have in common is their accuracy drops off rapidly with increasing range. It may not be practical to stay beyond their maximum range, but it is probably possible to keep enough distance, to make it highly unlikely critical systems can be destroyed before the cutter can react. National Security Cutters would never experience this trap during the next 40 years. Why ? because the NSC web site says that each NSC has a S.C.I.F. No one really knows what that means except that it, no doubt, costs dozens of millions of dollars. DoD Intelligence services are so good that now, in 2012, the US Navy still has its spy ship, USS Pueblo AGER-2, held by a foreign government: North Korea continues to hold this old spy ship, while the U.S. Navy continues to count it as a commissioned USN warship to this day. So, our NSC’s are unlikely to experience what this brave Australian ship ran into. No doubt, all the 25 new WMSM’s will also be equipped with whatever a S.C.I.F. is, so they will also be safe from any such enemy and future terrorist traps. Found a new source on this battle including photos of the sunken ships in their final resting places. Info and video from a recent UUV dive on the wreck of HMAS Sydney showing her bridge was hit by 150 mm shell. Not a lot of new info, but one thing that particularly impressed me was a hit squarely in the center of one of her twin 6″ turrets. It is apparent the Kormoran’s gunners were able to quickly knock out critical systems. Pingback: Return of the Clandestine Merchant Raider?